Four videos recorded during a beautiful wedding party at L’Ustaria Cà dal Rat Via Novara 66, 28016 Orta San Giulio, Novara, Lago d’Orta. Orta San Giulio is a very nice little town and the restaurant is located by the Lago d’Orta lakeside. The Orta lake is simply amazing and this area is one of the most beautiful part of northern Italy. The bride and groom with their guests had arrived directly to restaurant with a boat after the ceremony. Guty & Simone were playing their song choices while they were landing. The L’Ustaria Cà dal Rat personnel is very friendly and experienced, they cook really good and there is a magical atmosphere by the lake. 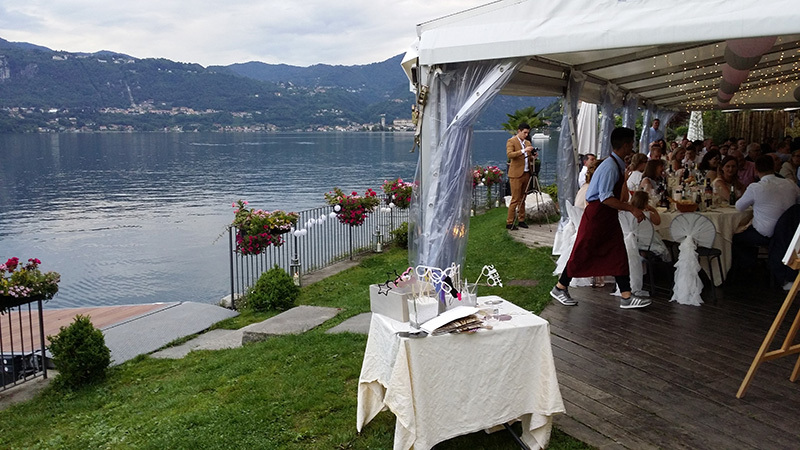 The wedding planners of the day are Wedding box lake Como a very good award winning wedding planning team based on Lake Como. A WEDDING WITH G. & S.